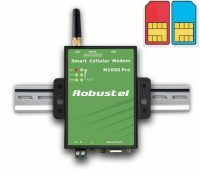 Industrial Cellular Modems connect serial devices to the mobile cellular networks. Dual SIM models give increased reliability. High gain antennae are available for poor signal strength areas. Industrial Cellular Modems allow Serial devices to be accessed and controlled over the mobile networks. The cellular serial RS232/485 modems are designed to transmit serial data and short messages (SMS). Now you can send and receive data from your serial M2M equipment wherever there is mobile phone coverage. High gain antennae can be used in poor reception areas. Dual SIM cards enable one network to operate should the other network fail. For advice on the best product for your application, call +44 (0)1202 861512.